American Precision Avionics is a Duluth, Minnesota - based manufacturing facility, with an emphasis on custom wire harnesses for the aviation industry. Before the development of American Precision Avionics, there existed American Precision Assemblers in Hampshire, Illinois. In 1996, American Precision Assemblers started filling POs for Cirrus Aircraft. However, it was not known by the Hampshire company who the POs were for. A decade had passed before American Precision Assemblers finally discovered who they were for, and the two companies built a connection. 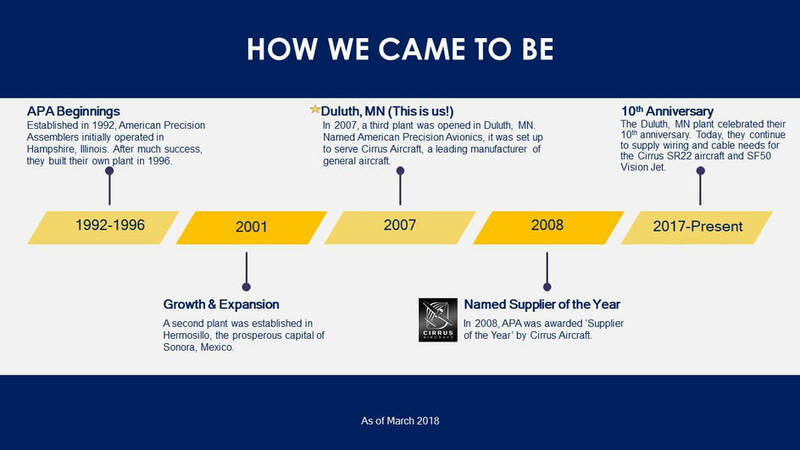 A year later, in 2007, American Precision Avionics (APA) in Duluth, Minnesota was born. With humble beginnings of just 10 employees and two operational benches, American Precision Avionics set out to be the main supplier for Cirrus Aircraft. In 2011, APA accomplished their goal and become the sole provider of custom wire harnesses to Cirrus. Fast forward to today, and we have grown so much. Our current team at APA consists of 95 employees on about 20,000 Sq Ft of operational production floor. APA has very large goals for the future. The American Precision Avionics team is dedicated to spread our quality custom wire harnesses across the aviation and aerospace market. Not only would we like to show our expertise in aviation, but also expand to many other markets. We will do this by showcasing to our customers that no matter the wire harness, we will make it with the utmost quality and efficiency. For more information on how APA can help you click -- HERE!